This page contains short tutorials using sample files. You can download sample files from here. "TutorialData_01.zip" contains files below. 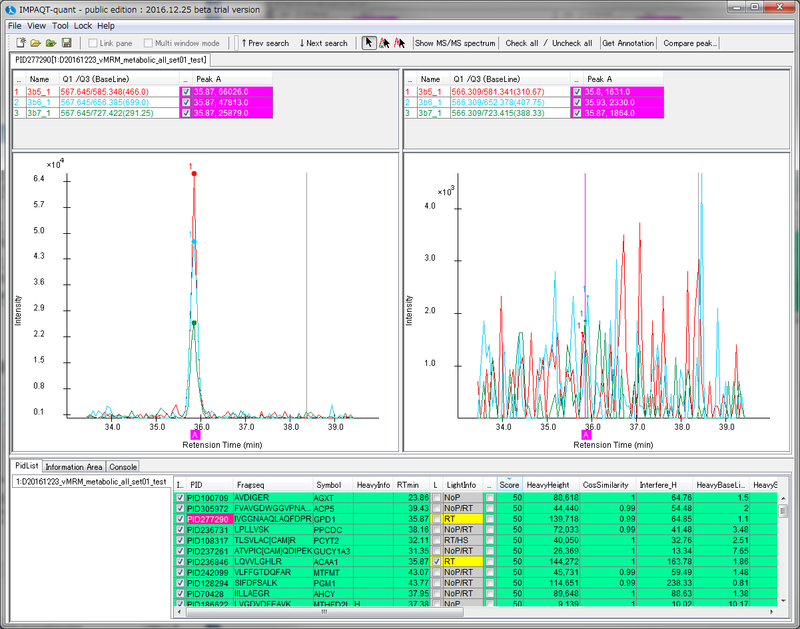 Use for "Import a raw file and analysis"
D20161223_vMRM_metabolic all set01 test.wiff.scan Sciex rawdata files. Use for "Open iMPAQT-quant file"
Download a windows installer (able to convert vender files) and install ProteoWizrad. If "Select ProteoWizard Directory" dialog appears, select the ProteoWizard folder. Select [File] -> [Import raw data and analysis...] menu. 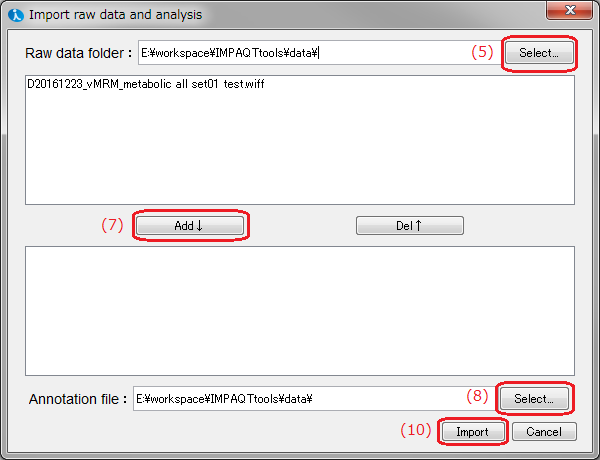 → "Import raw data and analysis" dialog appears. Click [Select...] button in the top right corner of the dialog. Select the directory holding sample files. → Raw files are listed. Select "D20161223_vMRM_metabolic all set01 test.wiff" file and click [add↓] button. Click [Select...] button in the bottom right corner of the dialog. → When data importing process is over, a information dialog appears and shows data on PID list view. Click a data on PID list view. If "Select ProteoWizard Directory" dialog appears, click [Skip] button. Select [File] -> [Open iMPAQT-quant file...] menu. → When data opening process is over, shows data on PID list view.